This book is written by a Local Kanata Mom. 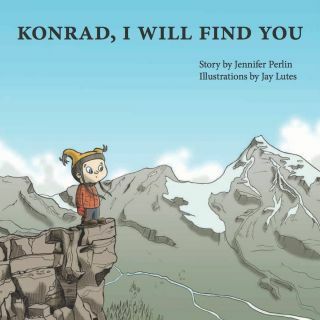 Konrad, I Will Find You is a children's book about separation anxiety, written by Jennifer Perlin and illustrated by Jay Lutes. Konrad, I Will Find You is a book about separation anxiety and new beginnings for young children. Jennifer and her husband, Michael, got the idea for the book when their anxious 2 year-old son, Konrad, explained that he didn’t like being dropped off at daycare because he was worried that he wouldn’t be found at the end of the day. Jennifer would try to reassure Konrad by explaining that he would always be found no matter where he was. This dialogue and reassurance helped Konrad cope with his anxieties during this difficult time of transition. By using animated dialogue between Konrad and his parents, and vivid illustrations, Konrad, I Will Find You allows young children to have a fun adventure with their caregivers as their imaginations takes them to all kinds of amazing and far off places! And for any child who may be feeling nervous about an imminent or current milestone — such as a new school or daycare, or a first sleepover at Grandma and Grandpa’s — it is hoped that this book will provide some needed comfort to children to take that next step, and be reassured that they will always be found, no matter where they are.